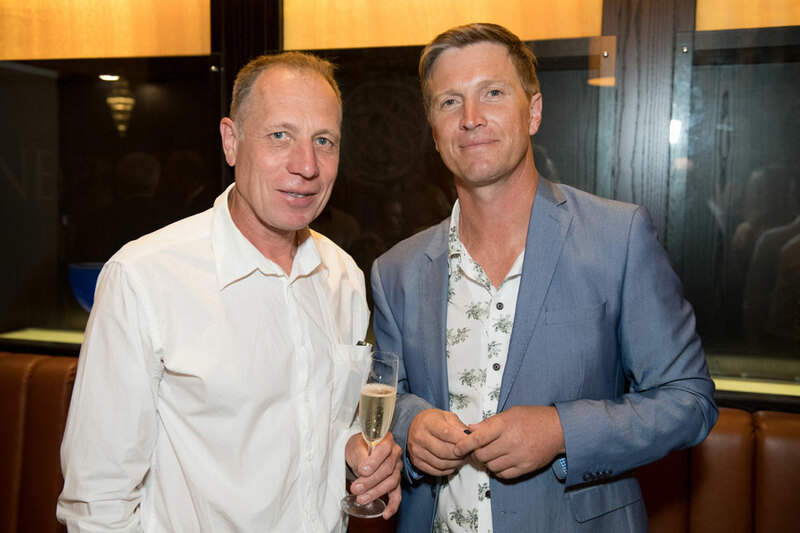 The second instalment of New Zealand Winemaker of the Year, held at Gusto at the Grand in Auckland’s SkyCity and proudly supported by Vintec, was a who’s who of New Zealand wine. 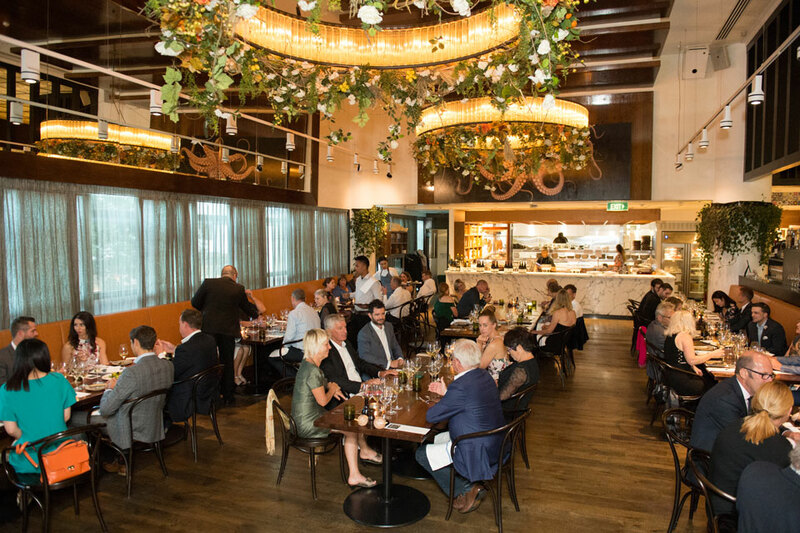 Sean Connolly’s hatted restaurant, Gusto at the Grand in Auckland’s SkyCity, is renowned for its exceptional food and cracking wine list, so that’s exactly where we headed to hold Gourmet Traveller WINE’s annual NZ Winemaker of the Year awards in conjunction with Vintec. It would have been difficult to find a more helpful, creative and congenial team than Richard Seldon, restaurant manager Jeremy Bayet, sommelier Marek Przyborek, and head chef Vaughan Kay and his kitchen brigade who went above and beyond the norm to make sure New Zealand’s winemakers were properly honoured on a lovely summer evening at the end of January. 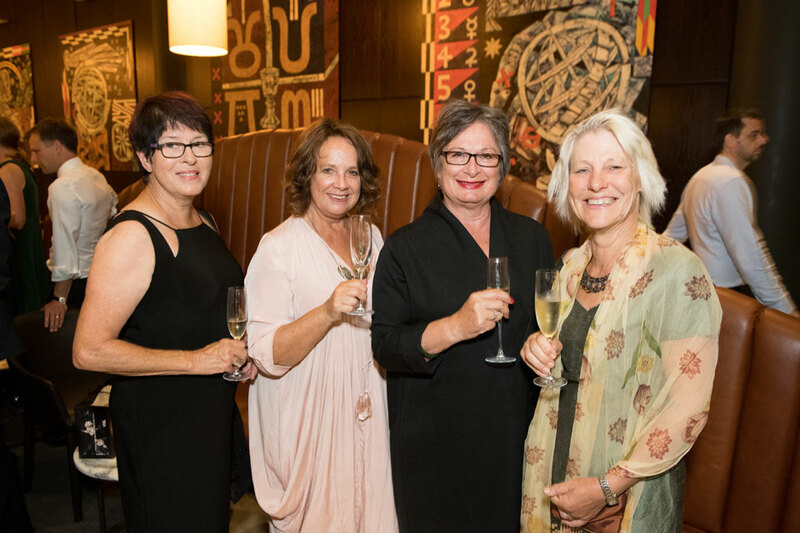 With all looking spectacular in the restaurant, New Zealand’s winemaking elite gathered for pre-dinner drinks. A choice of Rudi Bauer’s robust and flavoursome Quartz Reef Blanc de Blancs or a refreshing NZ Reid+Reid gin and tonic were served with canapés, while Tim Severne from Antipodes, who had recommended Gusto at the Grand in the first place, made sure we all remained hydrated with what we think is one of the finest waters around – and certainly when tasting wine. 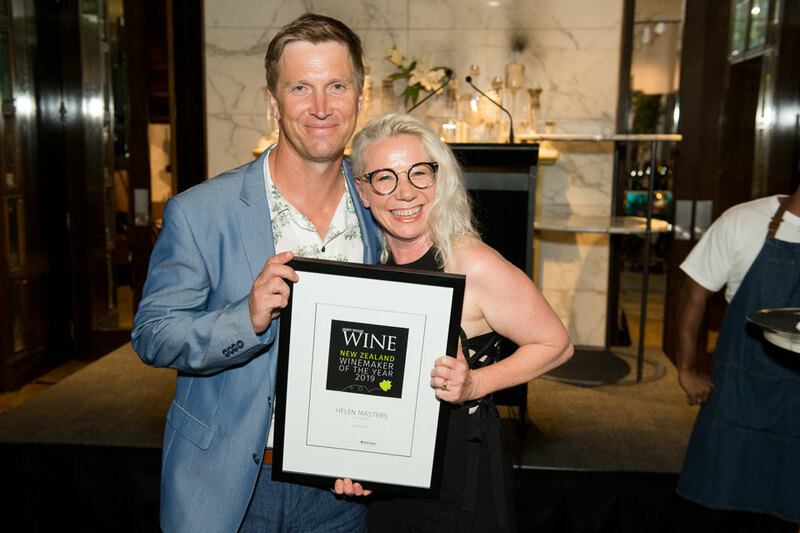 Finalists from far and wide were there including Helen Masters from Ata Rangi with husband Ben and the winery’s founders Phyll and Clive Paton. 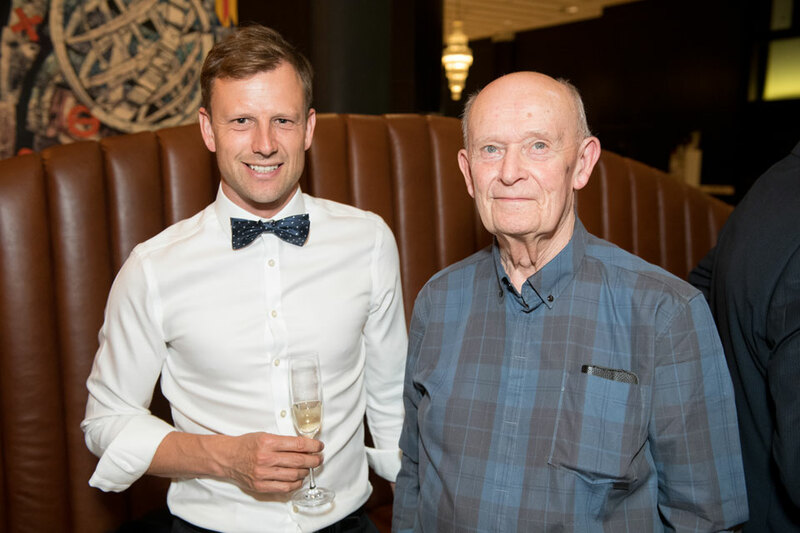 Dr Andrew Hedley of Framingham arrived with his UK-based parents who, even at that stage, had no idea he was up for an award. 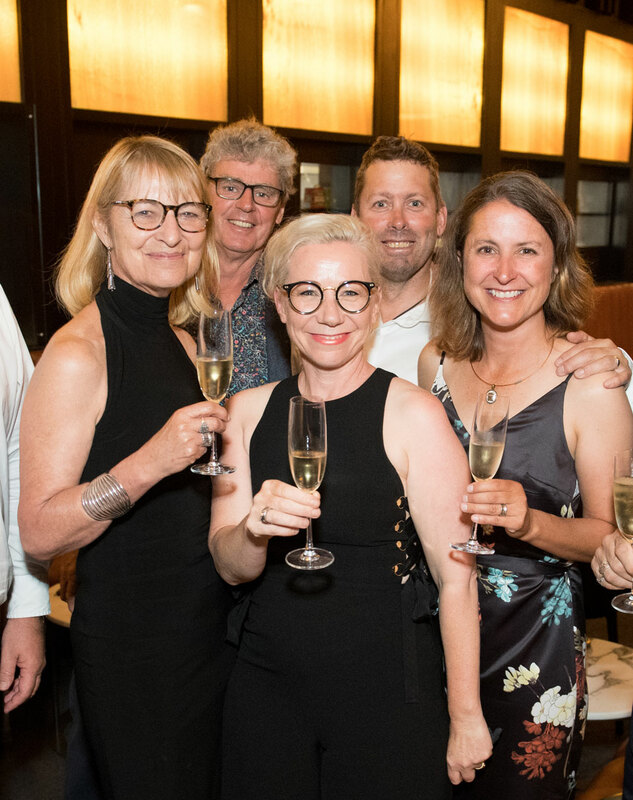 The gregarious Jen Parr of Valli bounced in, while James Healy from Dog Point arrived with business partner and viticulturist Ivan Sutherland. 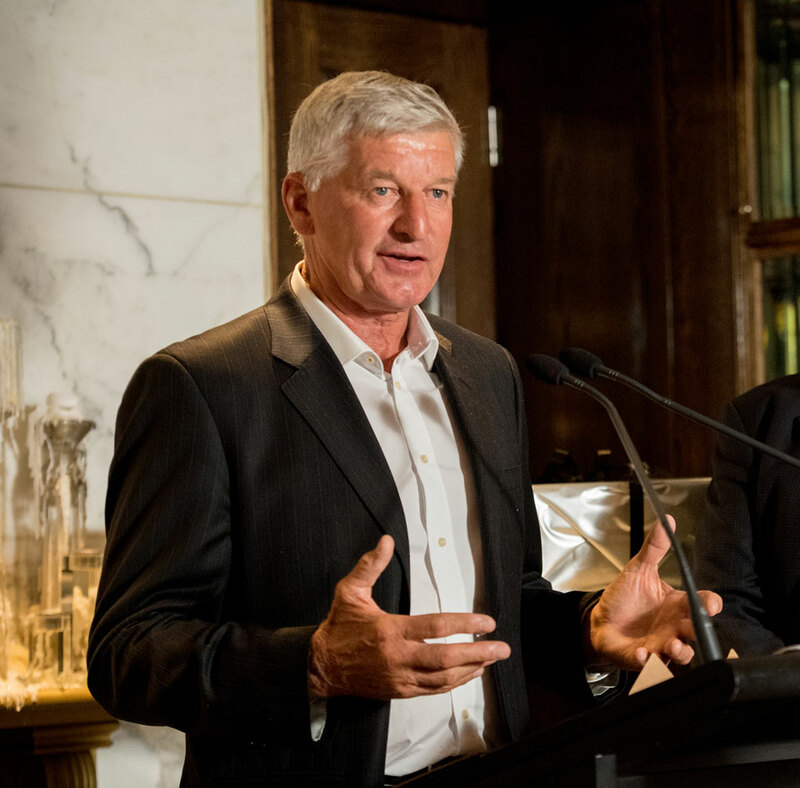 Winemaker Richard Ellis stood in for Kevin Judd from Greywacke who was travelling overseas at the time, while Peter Cowley, the only winemaker to have been nominated for a second time, seemed pleased to find himself in for another round of awards before retiring after 34 years at Te Mata Estate. 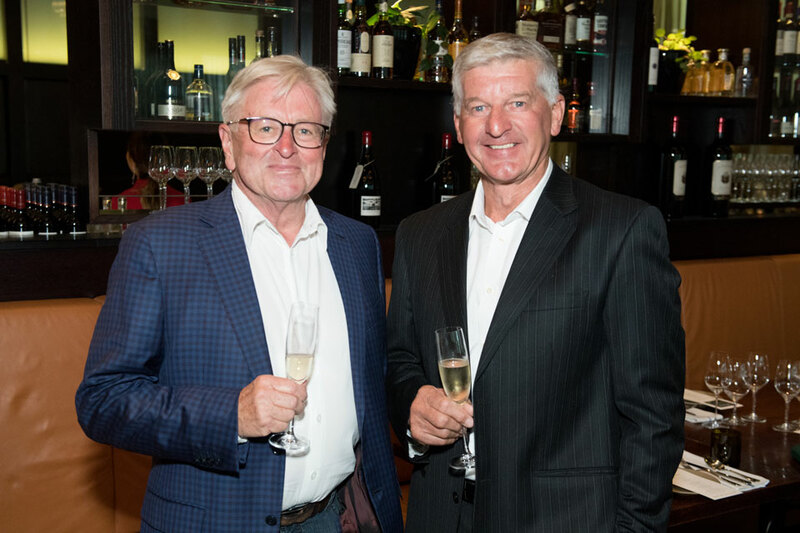 MC for the night, New Zealand editor and chair of judges Bob Campbell ONZM, MW brought more gravitas than ever to the event having received his Queen’s New Year’s honour. His fellow judges were Cameron Douglas MS and the late Raymond Chan who will be remembered for judging both the 2018 and 2019 awards. I was tasked with welcoming guests and explaining that only the most exceptional winemakers were selected for consideration by the members of the judging panel, who keep a vigilant watch on exactly what is being achieved in the wineries and vineyards throughout the year, and then pick contenders on the merit of the wines they have produced in the recent past. I must say, considering the number of winemakers in New Zealand, it’s quite an achievement to be listed among the top six. Dinner began with three exquisite whites, including the pure and flinty 2016 Greywacke Wild Sauvignon Blanc served in the stunning new Riedel Veritas Sauvignon Blanc glass which had winemakers intrigued, and some even wanting to order stemware for themselves. The concentrated and classy 2016 Dog Point Chardonnay preceded a very special treat, the 2003 Framingham Select Riesling. This was the first vintage made, and there were only ever 40 cases of it, so it was remarkable that Dr Andrew Hedley had bottles saved and generously shared them with us. To his great credit, Gusto at the Grand’s head chef Vaughan Kay had decided to think outside the box when creating the menu for the dinner. Instead of taking the traditional route of matching one dish to each flight of three wines, he instead decided to match a dish to every single wine, serving three shared plates per course, and it worked. 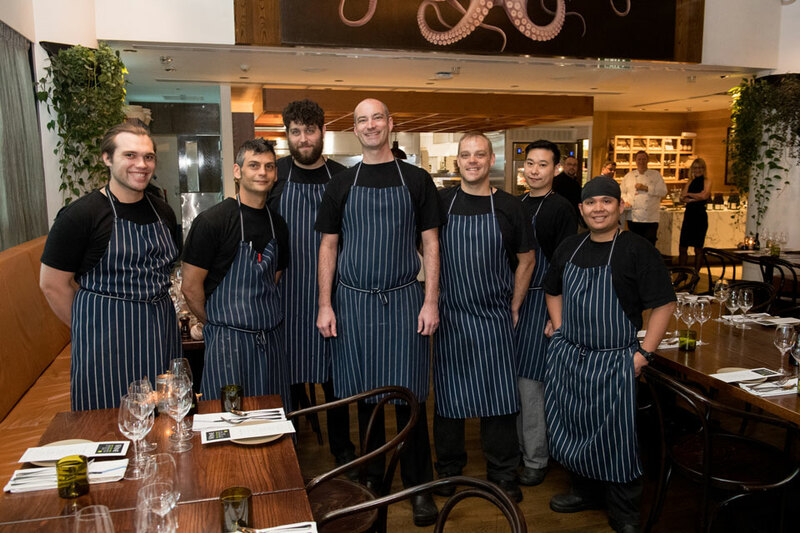 We dined on tender octopus carpaccio, caper, shallot & chilli; salty San Daniele prosciutto; as well as delicious pickled zucchini and cauliflower fritti with aioli respectively matched to the line-up of whites. The second course proved to be equally as thrilling with three of New Zealand’s most outstanding pinot noirs on show. Tasting from left to right we enjoyed the 2016 Valli Gibbston Pinot Noir, the best of the winery’s subregional pinots from founder Grant Taylor’s own carefully sited vineyard. 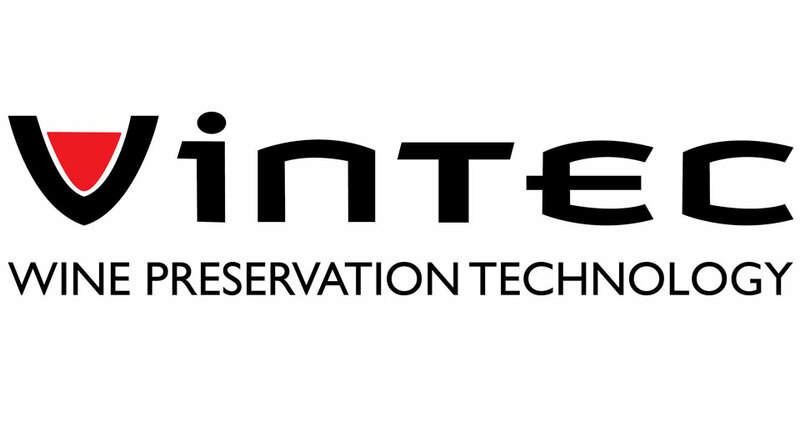 The fragrant and aromatic 2016 Dog Point Pinot Noir followed, while the 2013 Ata Rangi Pinot Noir, with its trademark savoury characters and plum and dark berry fruit, rounded out the bracket. Proving how versatile pinot noir can be when pairing with food, Vaughan Kay presented us with a trio of dishes including aromatic casarecce with Ligurian pesto, potato, beans and pecorino; grilled snapper, zucchini flowers, peas and mint; and lamb cutlets with summer beans, garlic and mint all of which, in their own way, complemented the wines beautifully. 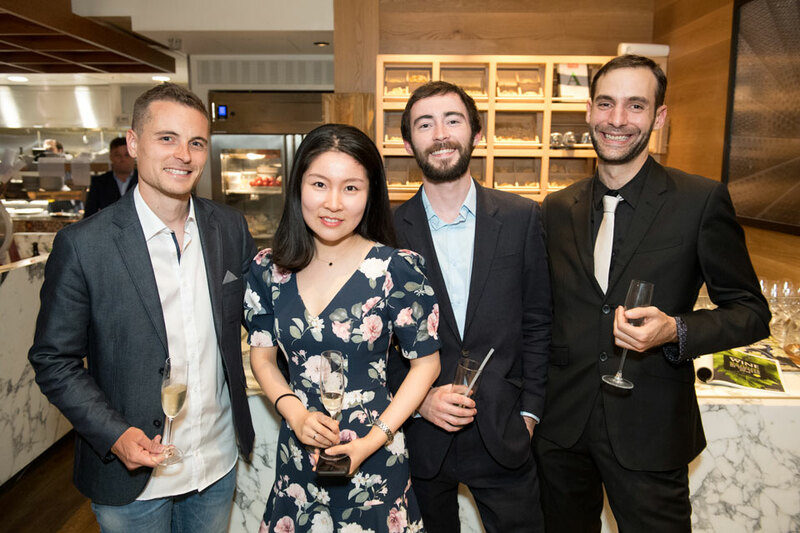 While the spectacular array of Riedel glasses, especially shipped in for the night, continued to be topped up, Thibaut Caumont of Vintec and I headed to the stage to hand out awards to the six finalists, while Bob Campbell invited each of them to the stage. 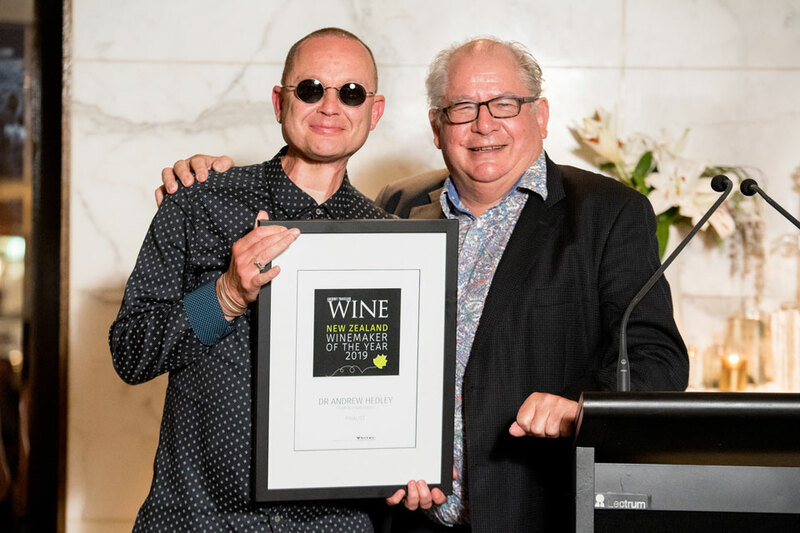 Greywacke winemaker Richard Ellis stood in for Marlborough winemaker and finalist, Kevin Judd who was away travelling, while self-confessed “Bordeaux man” and technical director of Te Mata Estate, Peter Cowley picked up a finalist gong for a second year running. All were toasted with the excellent 2014 Te Mata Estate Bullnose Syrah that had been poured to accompany the course of New Zealand cheeses from around the land. It was, at last, time for the major awards to be announced. Each winner received an elegantly framed certificate and a magnificent Riedel Amadeo decanter. The Leadership Award, given to someone who has made a difference through their actions and has inspired others to follow their lead, was first to be announced. 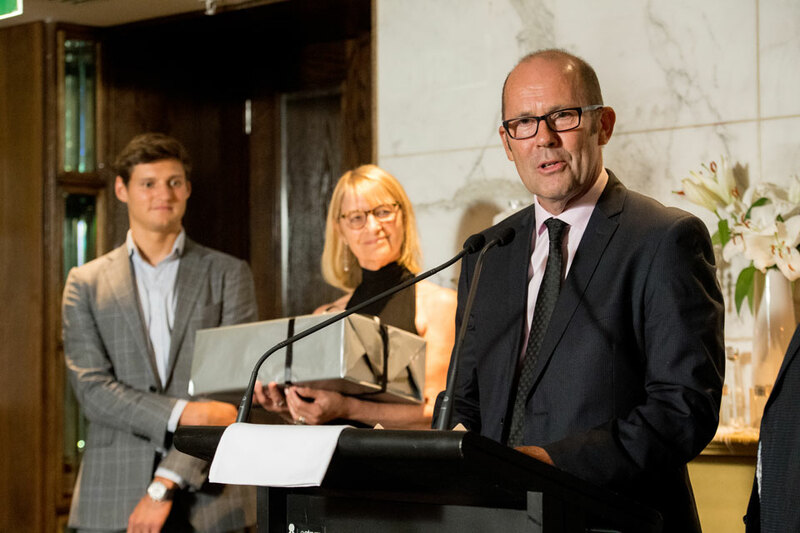 Campbell said the judges threw the net wide but were in close agreement on the final winner, Rudi Bauer of Quartz Reef, who gave a moving speech on how the NZ wine community should continue to support each other and to work together as it has over the years. 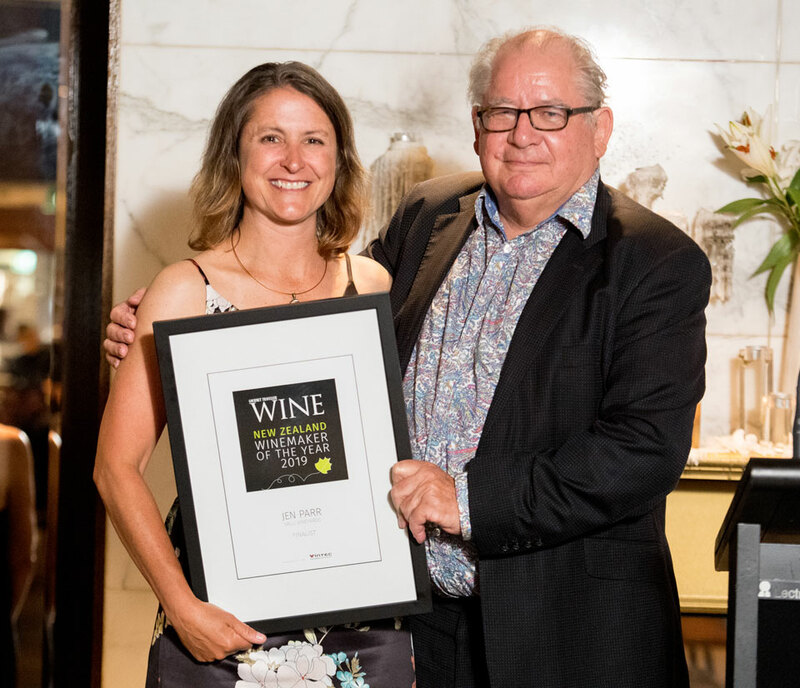 Masters, who has quietly been making extraordinary wine at Ata Rangi for many years said how honoured she was to receive the award, but just as importantly how happy she was to be spending an evening in the company of her fellow winemakers. It was a memorable night for one and all.